It deemed appropriate to me to that I write my first herb profile for my blog on Red Clover or Trifolium pratense. When I graduated from herb school my teacher gave each student the spirit of a plant that represented that student and the gifts they would bring to this world, mine was Red Clover. Now when I first began herb school this was one of the first herbs I connected with, off the bat I started drinking simple infusions of this nourishing plant and I was in love. This plant represents gentle strength, it’s a gentle herb yet a powerful healer. To me it represents patient determination and focus, it inspires one to work steadily with grace and devotion to achieve one’s dreams and manifest one’s visions. It grows virtually everywhere and is an extremely widespread naturalized plant. I’ve harvested Red Clover high in the alpine country on my family’s property in Leadville, Colorado and I’ve plucked blossoms all around Europe from Spain, Slovenia, and Croatia to the countryside of Ireland and vibrant gardens of Scotland. This plant loves to share its gifts far and wide. It provides nourishment to many beings not just humans; it’s a crucial food source for pollinators especially bees, livestock, and so many more animals. It improves soil health through being a powerful nitrogen fixer and in turn it supports many other plants and consequently ecosystems as a whole. So, what about the healing virtues of this plant? Red Clover is well known as a traditional spring tonic and “blood purifier,” in Appalachian Folk Medicine. I can say that drinking a cup of this nourishing plant each day is not such a bad idea. It has a sweet and nourishing taste that is very mild. 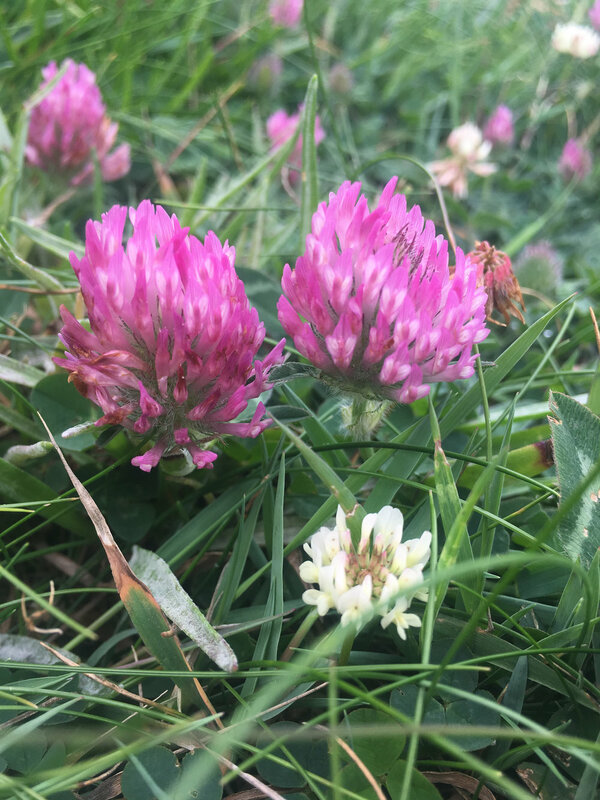 First off, Red Clover is one of our famous nutritive herbs due to its high mineral content, in just one ounce of the flowering tops there lies half the minimum daily requirement of calcium, about a fourth of the requirement of magnesium, and a third of the requirement for potassium. In the United States and around the world many individuals are suffering from a wide range of nutrient deficiencies and due to modern day agriculture, much of our top soil is heavily depleted in the minerals our bodies so deeply need, making herbs like Red Clover powerful allies in replenishing bodily stores of these crucial minerals. Red Clover is also high in flavonoids and has some antioxidant activity which may reveal why it has a traditional use as an anti-cancer herb. Indigenous peoples of British Columbia would use an infusion of the flowers for stomach cancer. Red Clover is also one of our most acclaimed alterative herbs. Alterative herbs are incredibly broad and powerful in their actions. Essentially, they work on improving various metabolic systems in the body through supporting and encouraging proper assimilation of nutrients as well as proper cleansing and elimination of toxins in the body. William Cook a famous herbalist from the 1800’s describes alteratives as those herbs which, “act slowly, moderately, and steadily in bettering the condition of circulating fluid.” By circulating fluid, we are referring to blood, lymph, extracellular fluid, and consequently the vital force of the body. Through improving the quality of these fluids and also providing a tonifying effect to the organs that are in control of metabolizing and mobilizing these fluids alterative herbs like Red Clover work on a very deep level to restore balance to the body. Red Clover also has many other actions it is an expectorant helping to clear the lungs as well as providing a nourishing and tonifying affect to the lung tissue. It also has some antispasmodic qualities and when this is combined with its affinity for the lungs it’s easy to see why it is useful herb in conditions such as whooping cough or any condition where a spasmodic cough is present. Lastly due to its phytoestrogen content this herb as been used to alleviate the symptoms of menopause. However, the studies reveal that these claims may be a bit inflated, nonetheless Red Clover has been scientifically proven to have positive health effects on plasma lipid concentrations and therefore may reduce the risk of cardiovascular disease, which affects many women of menopausal age. Red Clover does have some blood thinning effects and is therefore not recommended in conjunction with certain pharmaceuticals. As always it is best to consult a licensed healthcare practitioner or certified herbalist before utilizing this herb. My favorite way to utilize this herb is in tea form or infusion form. It combines well with other nutritive and alterative herbs. It is easily cultivated and grows abundantly around the world. It is an herb we can turn too when we need gentle yet deep healing and it’s certainly one of my greatest allies, I hope you too can enjoy it’s many gifts.